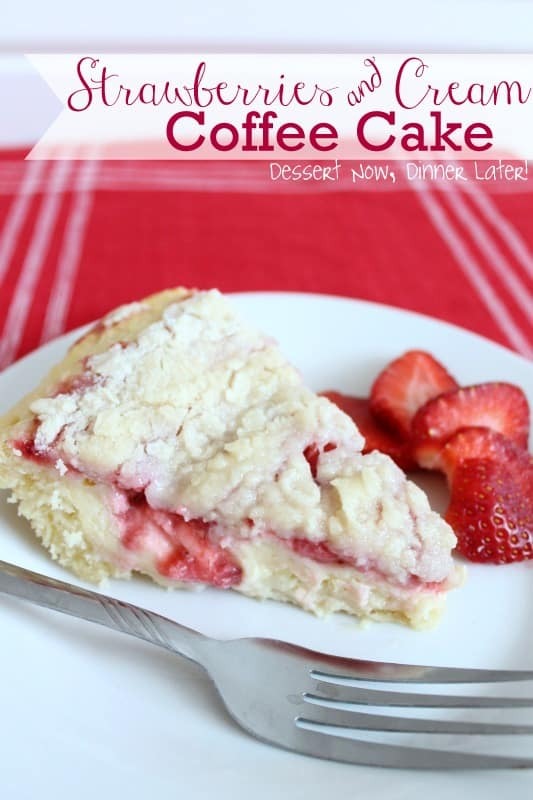 Strawberries & Cream Coffee Cake - Dessert Now, Dinner Later! Oh. My. Gosh. This cake is so good! I told my husband that this will probably be my birthday cake this year! 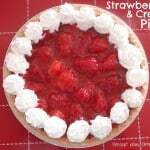 It was moist, fruity, creamy, perfection! It’s almost more cheesecake than coffee cake, but I loved the fruit & crumble topping. The ratio of butter cake to cheesecake & fruit is just perfect! It adds a whole other depth of chewy crumbly texture to enjoy with the smooth creamy filling & sweet fruit. It’s like all the good stuff in one dessert: cake, pie, & cheesecake all in one. I loved every last bite! I cannot recommend this cake more! Make it! Preheat the oven to 350*F. Line a 9-inch round pan with removable bottom with a circle of parchment. Using baking spray, coat the sides of the pan. I also spray a little baking spray on the bottom, underneath the parchment to help hold it in place. PREPARE THE STRAWBERRY JAM: Combine cornstarch & water in a bowl to make a slurry. Mix the strawberries & sugar in a small saucepan. Cook over low heat until the strawberries release their juices; about 5 minutes. Then add the cornstarch slurry & stir until well-combined Stir for another minute or two until it has thickened. Remove from heat & cool to room temperature while you prepare the rest of the cake. PREPARE THE CREAM CHEESE FILLING: Using a hand mixer, in a medium size bowl, beat the cream cheese on medium speed for about 30 seconds until smooth. Add in the sugar & egg & beat until well-combined. Set aside. PREPARE THE CAKE: Combine the flour & sugar in a stand mixer. Cut in the butter with the paddle attachment on low until mixture resembles coarse crumbs. Measure ¾ cup of the mixture & set aside. Add the baking soda, baking powder & salt to the remaining mixture. In another bowl, whisk sour cream, egg & vanilla until well-blended. Add this wet mixture to the dry mixture until just incorporated. Will be thick & lumpy. Scrape bowl as needed. ASSEMBLE THE CAKE & BAKE: Spread the cake batter in the pan coming up the sides making a border & leaving a well in the center. 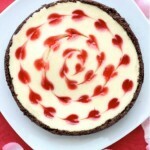 Pour cream cheese mixture in the center over the cake batter, being careful not to go beyond the border. Spread the strawberry jam on top of the cream cheese mixture. 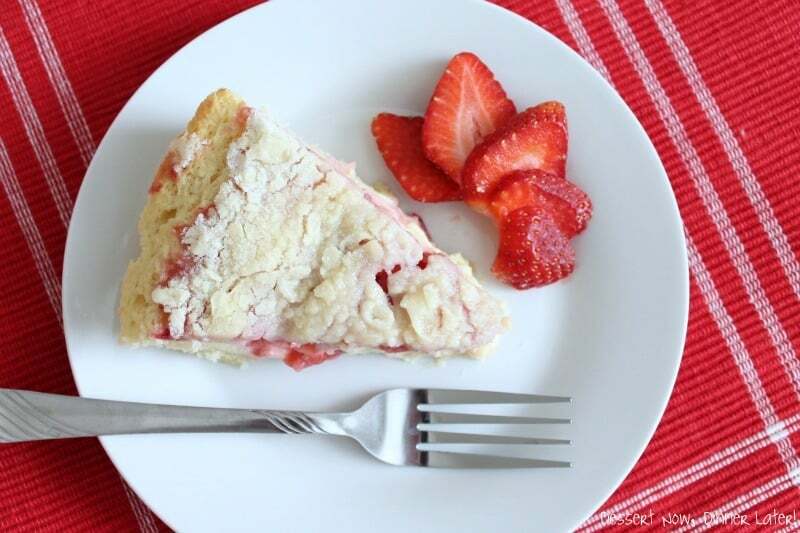 Sprinkle the remaining ¾ cup crumbs over the strawberry filling. Bake for 50-60 minutes until the center is set & doesn't jiggle. Cool in the pan on a wire rack for 20 minutes before removing the cake. Recipe from Food Wanderings in Asia & re-written in my own words. Wow, this looks so delicious! I’ve been wanting to try making a coffee cake and this might be the one! As far as typical coffee cake, this is far from it, but it is a great alternative to just coffee cake. So good! This looks SO yummy! 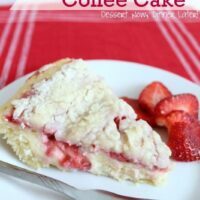 I love coffee cake, but never thought of trying a new version! This is a great version to try 🙂 Thanks for stopping by! This looks divine Amber! I made a coffee cake on sunday. It was dry & lifeless. I’m going to make this one next time! Pinned! This will melt in your mouth! Let me know what you think! I am dreaming of this for my birthday cake, but that’s not until the end of summer…I might not make it that long before I make this again! Haha. 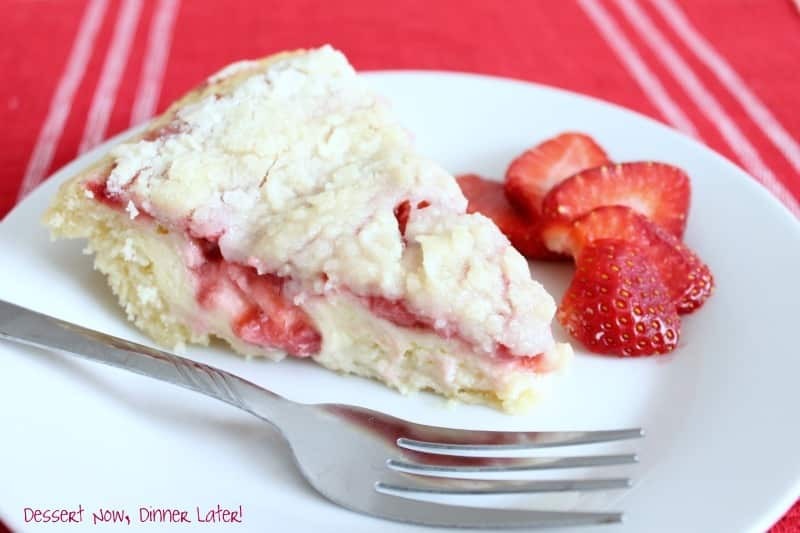 Love the cream cheese filling and strawberries are my favorite! This coffee cake needs to make an appearance at my house ASAP! Jess, you will love this! So yummy! Hey amber, I’m planning to make it at my house soon. I liked the images of this cake. It looks very tasty. I don’t know if I could make it right, because I’m not good at cooking. But I’ll try. What a great combination of coffee cake and cheesecake. It will be on my next brunch table. Yummy. 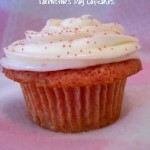 I think I will be making this today! 🙂 This looks amazing and I have everything in the house to make it. Thank you for sharing. Great recipe!!!! 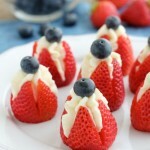 I want to be adventurous and use different kinds of fruit filling. I would go with canned pie filling for something easy… blueberry would be first. This kind of reminds me of some of the Entenmanns coffecakes. Thanks for sharing this recipe! It was delicious! We have fresh black raspberries ripe for picking in our back yard right now, so I used them instead of strawberries. Very yummy! I will make it again! Oh wow, black raspberries! I bet that was fabulous!